General purpose digital thermometers to control temperatures fast and with high accuracy. Thermometer manufacturer Termoprodukt. 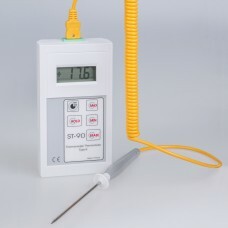 In our offer we have digital thermometers which can work in any industrial factory. With great accuracy, platinum probes termoprodukt thermometers can work in small home manufactures as thermometers for cooking, smoking, baking and in big companies as HACCP thermometers, laboratory thermometers etc. General purpose digital thermometers are perfect solution for everyone who wants to control temperatures fast and with high accuracy. You can choose small hand held thermometer or big display thermometer for hard coditions. Accuracy for our thermometers is 0.07°C, resolution 0.01°C. 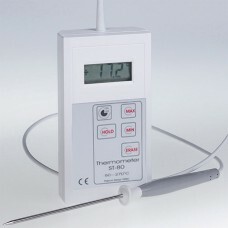 Termoprodukt digital thermometers have wide range of temperature control. Industrial digital portable thermocouple probe thermometer ST-90 measures temperature over the range..
Probe digital thermometer with PT-1000 sensor, accuracy 0.1°C. Response time less than 5 seconds. Ac..